Bronze Rank Advancement - YEAH!!! I ranked Bronze Leader on September 1, 2012. This was exciting to me because it signified progress in a home business and I did not expect that at all. 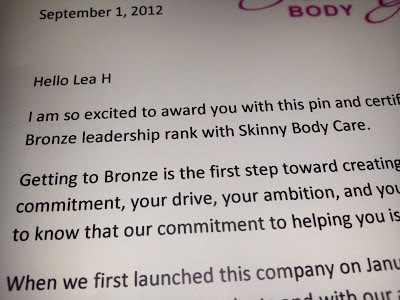 I received this Certificate of Achievement, a Bronze Skinny Body Care Independent Distributor pin and a letter of "congrats: from the owner of the company. HUGE SMILES of course :) Best of all, this has been a stress-free experience. The team support and training have always been available for me with no pressure; everyone is so nice. I am one that usually does well in a company, though does not hit the rank advancement schedule they set for me, so I am really happy to have had this experience. I have since changed my name to WAHMOM USA / CAN on my business websites, so the other advancements will probably say that on them. My goal in joining this company was to 1) try the Skinny Fiber to see how it worked for me and 2) if I found benefit with the Skinny Fiber product, to build a Skinny Body Care business with other moms. Hence the name WAHMOM (Work at home mom). I have to admit that I did not have a lot of time to start a business, yet I became a Skinny Fiber distributor knowing that it would take me time to build a customer base. It was not been a hard business for us at all. I just keep building a few hours a week ... I track all in the virtual office the company provides me. Best of all ... Not only are you helping people take control of their weight loss / health, NO ONE is skipped over for their advancements with this company. 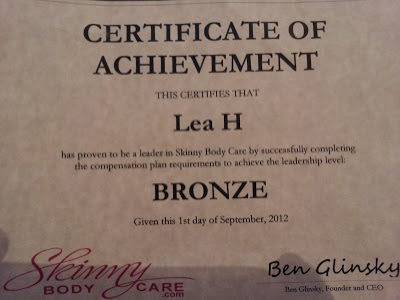 You get what you earn with Skinny Body Care Independent Distributor program (weight loss, financially, personally). I like that! What does Bronze Rank Advancement mean? You can learn more by Watching This Video about how to become a distributor and the 8 level pay plan. This is an awesome work at home mom business for sure!